Ski season is almost upon us, and you may be thinking about buying new gear for the kids. So here's a repost of one of my most popular entries in the This Mountain Life Blog. When meeting a group of children for a group or private lesson, the first thing I do is check to see how Mom and Dad have dressed them for the day. Heads - The most important thing is a helmet, of course, and Northstar provides these free of charge for children taking lessons. Our rental shop also has these available for a very reasonable $8 per day. Goggles are also a necessity, as they protect eyes from the sun and blowing snow. When choosing a helmet or renting one for your child, make sure it has a functioning goggle retaining strap at the rear of the helmet. Without this, your child is likely to have his or her goggles down over the mouth area, blocking out their shouts of glee. Hands - Wet and/or cold hands will ruin your child's experience and can make it hard to convince them that time on the mountain is fun. I prefer mittens over gloves and highly recommend those with cuff drawstrings. These can keep snow out or serve as a retention device. When putting them on, the child should insert his or her whole hand through the cuff drawstring first. The drawstring will make sure the glove stays with your child while skiing, on the chairlift, and during that walk to and from your car. 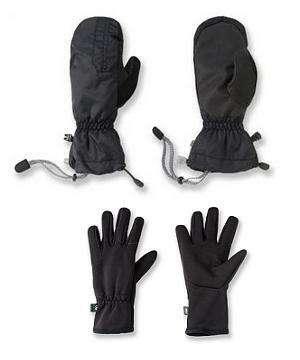 These REI "Three in One" mittens are a good option as they include a liner which can be worn solo on a warm day as well as that important drawstring. One type of mitten I don't particularly like has a velcro closure running up the side from wrist to the tip of the child's pinky. While these are very easy to get on, one fall can clog the velcro with snow, eliminating its ability to keep the glove closed at all. 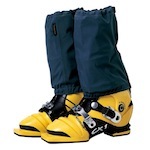 Feet - Ski boots should fit snugly, and there are some important rules of thumb for donning them. Only one Pair of Socks - Make sure your child is wearing thin socks and only one pair. While this may seem counter-intuitive, one thin pair provides more warmth and less pain than one or two thick woolly ones. Why? Multiple socks create folds between the shin and the soft, cushioned tongue of the boot, where your child will be applying pressure all day. No Underwear - While your kids may giggle at this rule, we're actually talking about inside the boots. Long underwear should not extend down over or under your socks. The seam as well as the spot of overlap creates a ridge, which we've hammered home is a definite no-no. Powder Cuff Outside - Most ski pants have an 4-5 inch cuff sewn inside the bottom of the pant leg. An elasticized band goes over the outside of the boot, extending below the top buckles. The cuff keeps snow out of the boot, and off of your lower leg. You can also buy stand alone gaiters (pictured) which perform the same function. The Rest of the Body -- Think Layers. My advice here is to dress for the weather you have, but pack for all possibilities. It's always better to have it and not need it, than to need it and not have it, with some small exceptions. Northstar's Ski and Snowboard School has a children's center located at mid-mountain just below the Big Easy beginner's area. In it, we have hooks and cubbies where instructors can store excess clothing if a child needs to shed a layer. A clothing list for the body would include long underwear, a long sleeved shirt or two if it's especially cold, a neck gaiter, ski pants and a ski parka. Try to avoid cotton shirts or thick wool sweaters; the former gets wet and stays wet, while the latter can cause over-heating. Hats - Your child will be wearing a helmet, and hats don't fit inside. 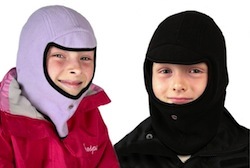 However, you can purchase a balaclava, which does. If you're preparing your offspring for their SAT's, you can tell them that a balaclava was a garment worn originally by soldiers serving in the Crimean War and is named after the village of Balaclava in the Crimea. If you want them to love wearing it, skip that, and tell them it's a Ninja Mask. Long scarves - These can catch on the chairlift and are another thing for a child to trip over while they're trying to learn. Lift tickets on their jacket zippers! If your child is like most, they'll come to love speeding down the trails. A lift ticket flapping in one's face is an annoyance at best or at worst, a distraction which can lead to a collision. Break out that sharpie and label everything, especially goggles, mittens or gloves. Apply a thick layer of sunscreen, and if your child will reapply, put a small tube in a pocket. Another good pocket stuffer is a note with your name and cell phone number. If your child carries their own phone, instituting a no-using-on-the-chairlift rule is worth considering. I've yet to find the iFly, iBounce or the I'm Waterproof application for my iPhone. Questions? Drop me a line at skiwithjay@gmail.com or call 415-601-1325.